This was something you don't see all the time at a wedding. A policeman on horseback. We didn't even know they still did that. Melissa and Chris had a lovely May wedding in 2012. Their wedding was at the Hyatt in downtown Buffalo. They wanted to go for pictures around the Niagara Square, City Hall area. But they loved the architecture and buildings around that whole area. We decided to take advantage of them and venture away from the Square. Everything was going great. We had finished with the wedding party and sent them back to the limo. It was time for portraits with the bride and groom. 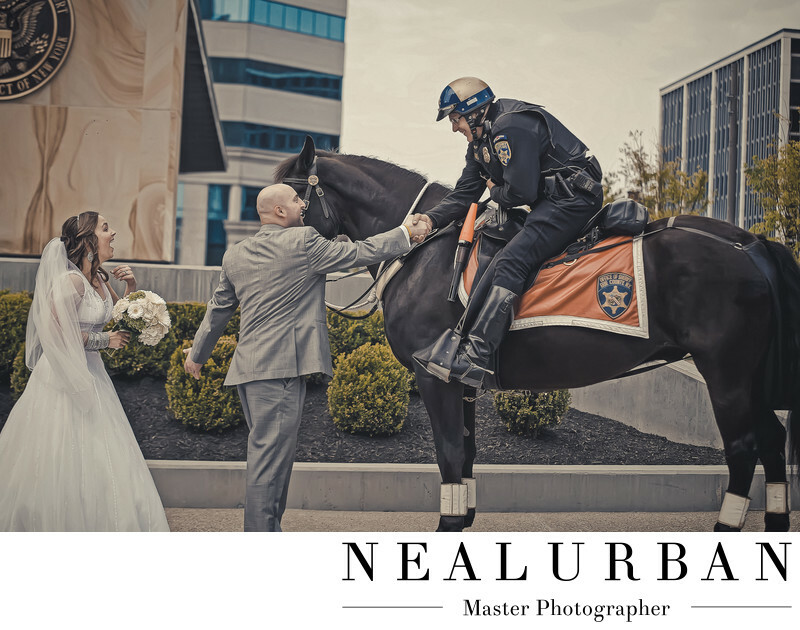 We were taking photos, when all of a sudden police officer on a horse was leisure riding over. He stopped to say congratulations when Chris realized he knew the cop. He gave him a friendly handshake. Then Melissa walks over and notices she knows him too. Her expression is great. She is shocked they knew him! Our first thoughts were we were getting in trouble for where we were taking photos. Thank god that was not the case. The police man actually posed for a few shots with the lovely couple. We had a nice series of photos with him. This was so much fun and so unexpected. Such a great story!